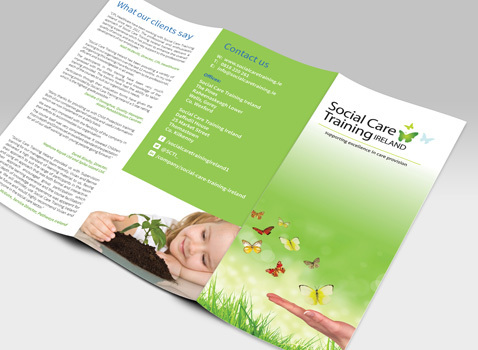 Social Care Training Ireland approached our team here at Alpha Design looking to revamp their existing information flyer with a fresh new design. We created a design that catered for their requirements, in keeping with their companies branding while giving it a fresh new look and a smoother layout. The layout of the flyer is an A4 fold to DL (or 1/3 of A4) and based on our recommendation, was printed onto a 170gsm gloss paper.